Sonus Faber was founded in 1980 by a group of passionate audiophiles, who decided to dedicate themselves to the design and production of a speaker system of superior musical quality; Franco Serblin, the originator of Sonus Faber was commissioned to handcraft a set of loudspeakers for a museum to demonstrate the sound of various famous violins and violas. The loudspeaker was a massive success, not only for the museum, and its patrons, but also the musicians who had recorded the audio tracks for the museum were immediately drawn to the incredibly realistic and musical sound with these loudspeakers. After accommodating them, in 1983 the Sonus Faber line was born manufacturing beautiful sounding loudspeakers for music lovers all over the world. When you first glance upon the Olympica III, even before a note is played thru them, you know that you in for something very special. 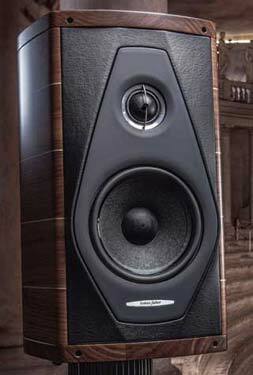 The fit and finish on these loudspeakers is superb; resembling more like a hand-crafted musical instrument. Built entirely in Italy by master carpenters and leatherworkers, the Sonus Faber Olympica III employs the highest quality fittings with numerous machined metal accents offering a stunning contrast to the natural hardwood planks which comprise the body of the cabinet. The Olympica III represents the essence of Sonus Faber’s old-world traditions of handcrafted hardwood cabinets, soft leather accents, and incomparable finishes. After taking a moment to appreciate the level of craftsmanship that the Olympica III’s offer, it’s now time to listen and be prepared for an experience that is unlike any other loudspeaker you may have ever come across. The high-frequencies in the musical performance with the Sonus Faber deliver a relaxed approach but with an engaging sense of musicality that makes many other loudspeakers sound harsh and gritty in comparison. When you listen to these loudspeakers, listen how easily you can easily distinguish all the emotion and subtleties of a string quartet without a hint of them sounding “steely” or harsh at any given moment. With the silk dome tweeter that Sonus Faber uses in the Olympica III you can now fully experience the intricate work of a jazz or rock drummer as they play all their various cymbals on their kit without feeling the need to turn the volume down on your system because it sounds overly bright or distorted. The midrange with these loudspeakers with the Olympica III may be the most difficult to describe as it just simply sounds like the artist or performers are right there in the room with you! The realistic sound of the Olympica III is extremely addictive, and when you take these loudspeakers home, be prepared for many long nights of marathon listening sessions rediscovering your entire music collection, this is why that the Sonus Faber Olympica III sounds like no other loudspeakers. The musical images that these loudspeakers create are amazing! The Olympica III loudspeakers continues in the tradition of what Sonus Faber has been doing since their beginnings, creating beautiful and musical sounding loudspeakers, manufactured by Italian craftsmen who take the approach of loudspeaker design and construction similar to someone who would handcraft a fine musical instrument. These loudspeakers look gorgeous, all the while delivering a musical performance that simply takes your breath away; what’s not to love! You owe it to yourself to take the time to visit and experience these amazing loudspeakers for yourself. The Olympica II, like the rest of the lineup are all handcrafted by Italian craftsman that take the approach of building a loudspeaker similar to creating a fine quality musical instrument. It only takes a second gazing at the outstanding quality of their beautiful Lyre style cabinets that gracefully taper back, this not only improves the sound quality by reducing standing waves inside the cabinet, but their styling allows you place these in about any listening area, while enhancing any décor. The listening experience of listening to the Sonus Faber Olympica II loudspeaker is always musical, and engaging regardless of your musical tastes. From the power of full symphony orchestra, to listening to a female vocal, the Olympica II allow you to fully hear how the artist wanted you experience their recording. The fabric dome tweeter that Sonus Faber utilizes in their loudspeakers allows you hear every nuance without any harshness that many other loudspeakers manufactures offer by using various types of metal domes for their tweeter designs. The Olympica II allows you to listen for hours on end without a hint of dreaded listening fatigue! The sound imaging of the Olympica II is outstanding! Just close your eyes and you’ll swear that the performers are right there in the room, playing just for you. 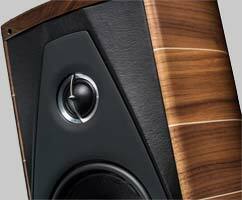 This has to do with Sonus Faber’s approach of incorporating the right drivers, crossover, and the cabinet as a whole; everything working in harmony together to deliver the sound experience you deserve. 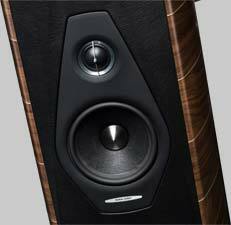 The Sonus Faber products are a welcome addition to the already strong lineup of loudspeakers here at The Stereo Shop. We are very proud to carry them; stop in today and take the time to listen to what they have to offer. The Sonus Faber Olympica I is their one and only bookshelf style loudspeaker in the Olympica lineup. They measure in at only fourteen inches in height, and a total of just over 42 inches with the optional, matching stands. The Olympica I is available in either Graphite, or a beautiful, walnut veneer finish. The Olympica I, like their other loudspeakers, are crafted by skilled, Italian craftsman designing a loudspeaker that looks as beautiful as the music that it creates when played back. They take the approach that every part of a loudspeaker; the drivers, crossover, and especially the cabinetry, work together in unison, creating music that sounds, well, like music. The silk, fabric dome that the Olympica is hand chosen by the designers at Sonus Faber themselves to deliver a smooth, relaxed, and engaging response, that allows you to discover the magic of the performance every time you listen to them. The cabinets, while looking extremely attractive, serve a very important function by allowing the music to flow thru effortlessly, without a hint that the music is being delivered thru a box. The Sonus Faber Olympica I are an excellent solution for anyone that desires a stand mount style speaker that is fully capable of delivering a spectacular musical performance. Also they would equally be a great choice for assembling a Home Theater of your dreams with a complete Olympica loudspeaker system. You owe it yourself to stop by The Stereo Shop and see all of the Sonus Faber loudspeaker offerings. Well you just purchased a pair of Sonus Faber Olympica loudspeakers and now you are assembling the Home Theater of your dreams and now you need the perfect center channel loudspeaker to compliment them. Which loudspeaker do you choose? Look no further, the master craftsmen at Sonus Faber have the right solution for you, the Olympica Center! With over eighty-percent of a movie’s audio content that is delivered from the center channel loudspeaker alone; why take a chance with just any center channel loudspeaker? The Olympica Center is designed to timbre match any of the Sonus Faber Olympica bookshelf or floorstanding loudspeakers, and looks just as gorgeous as any of them. And the sound of the Olympica center channel loudspeaker is very easy on your ears and allows you to hear every nuance of your favorite actors and actress dialog and delivers it with ease. We now have the Olympica Center channel setup in our McIntosh Home-Theater, we invite you to stop in soon and hear what you have been missing with your beloved movies. The name Sonus Faber is derived from Latin and means "handcrafted sound," a perfectly apt description of these elegant loudspeakers. Sonus Faber produces hand-built speakers in Italy by master carpenters and leatherworkers that combine the merits of Old World handcrafting with high technology to produce some of the most musical loudspeakers ever. Startling dynamics and a relaxed musical performance are just two of the results of this approach.